Luxury camping at Welcome to L'Ardéchois Campsite. What stands out about a L'Ardéchois camping holiday? Adjacent to the river with access to lots of water sports. Three-pool complex for all the family to enjoy. Terrific sight-seeing spots in surrounding areas. Excellent activities for the young and the old. 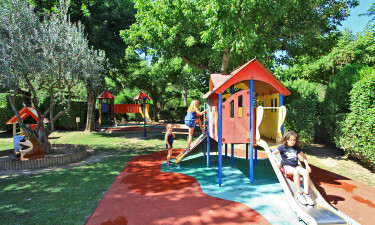 L'Ardéchois campsite comes fully equipped with all you'd expect from a superior site. There's a range of fantastically luxurious accommodation available, with mobile homes and bungalows, all of which have excellent amenities. There's a plethora of activities to choose from, a games and TV room, a football and boules pitch plus basketball, badminton and tennis courts. The kids will absolutely adore the climbing wall which is 3.7 m high, and the children's play area has slides, a swing, hut and a climbing net. 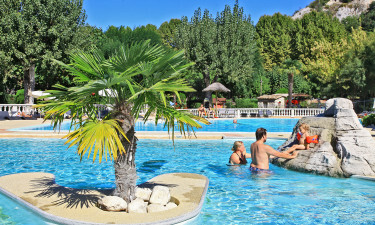 L'Ardéchois campsite has an excellent swimming pool complex with three lagoons to choose from. There's a small children's pool and two family pools. They come equipped with a lazy river feature, whirlpool, cascade and jacuzzi. After you've tired yourself out from all the water fun, you can relax on one of the many sun loungers, with their pretty parasols, and soak up some of that fine French weather. 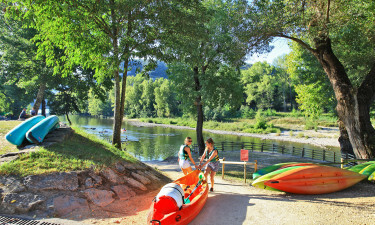 L'Ardéchois camping holiday resort sits directly on the banks of the Ardèche river, a local beauty spot that's not to be missed. You need a permit to go fishing there, and many locals do just that. A great way to take in all the sights and avail of the fresh country air is to rent a bike and cycle the surrounding areas. Canoeing lessons are available, and are also a unique way to ogle the naturally formed cave-like overpasses. If you'd like to relax just amble along the banks and enjoy the fine scenery. 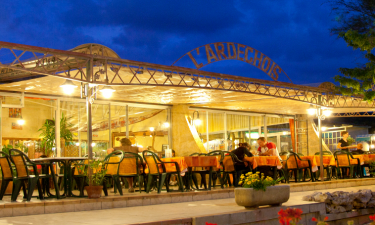 When you're not picnicking by the Ardèche river, the site has a resident restaurant that serves international and French cuisine - an excellent opportunity to try the local cuisine in a sophisticated environment. There's a take-away on the site as well as a bar where you can enjoy a chilled glass of wine or a beer or two. L'Ardéchois campsite comes complete with a well stocked supermarket. Stock up on French goodies, like coffee, wine, fresh bread and pastries, fruit and vegetables. Vallon Pont d'Arc town is just 1km from the site and will provide greater shopping opportunities for holidaying guests to enjoy. Don't forget to sample the local wine.